Living in Baltimore, I can't help but notice a lot of distinctly unhappy looking people around town. I know this is not exactly some kind of utopia, so is it reasonable to assume that people are, in general, happier elsewhere? NPR Correspondent Eric Weiner will be joining us at 1pm today to discuss what he learned travelling the world purposefully seeking out happiness. Check out his book The Geography of Bliss: One Grump's Search for the Happiest Places in the World. Living in Baltimore, I can’t help but notice a lot of distinctly unhappy looking people around town. I know this is not exactly some kind of utopia, so is it reasonable to assume that people are, in general, happier elsewhere? NPR Correspondent Eric Weiner will be joining us at 1pm today to discuss what he learned travelling the world purposefully seeking out happiness. 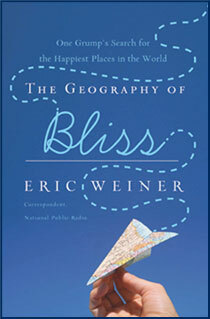 Check out his book The Geography of Bliss: One Grump’s Search for the Happiest Places in the World.